One of my biggest beefs with Evernote has always been the lack of an efficient way to share notes and notebooks. In fact, the lack of convenient sharing features was one of the reasons I considered a move to Springpad. Notebook sharing was a step in the right direction, and has been available in the web app for a while now, and even appeared in the Mac beta back in December. Unfortunately, Evernote’s excellent Windows desktop version has been sadly lacking — a source of niggling frustration for many users. It appears that that is about to change! If you want to the ability to access and update shared Evernote notebooks right from your Windows desktop app, all you have to do is click on the tools button, select options, and then check the little empty check-box under the General tab that says “Update to pre-release version when available.” Once that’s done, just click ok and then head over to the Help menu button and select “Check for updates.” Follow the prompts and upgrade Evernote. Once you are upgraded (current pre-release version is 4.3.0.4167), you will see that your Notebooks area with have two buttons: Account and Shared. Selecting the Shared tab will show you your shared notebooks, but you will probably not find any information in them. To fix that, simply click on the notebook and the properties window will pop up. Once there, adjust your sync time-frame, make sure that “Sync notes now” is selected, and click OK to update your local Evernote database with the shared notes! Do this for each shared notebook that you want to be able to access locally. If you want to start sharing notebooks — or modify permissions, or stop sharing — click the Manage Sharing button. The Notebook Sharing page inside the desktop application is easy to look at, and easy to navigate. Evernote note sharing is nearly complete! The only things left to do would be to add this new Notebook Sharing functionality to the Evernote mobile and tablet apps — and hopefully, one day, offer up a way to share individual notes by more than just email. How excited are you by Evernote for Windows’ new Notebook Sharing feature? Will you update to the pre-release? Thanks to 40Tech reader Daniel Gold for the tip! I think you need to be a premium/paid user. I’m not (yet) and the box is grayed-out. You don’t need to be a premium user to share, but you do need to be one if you want people to be able to create, edit, and delete notes in your shared notebook. 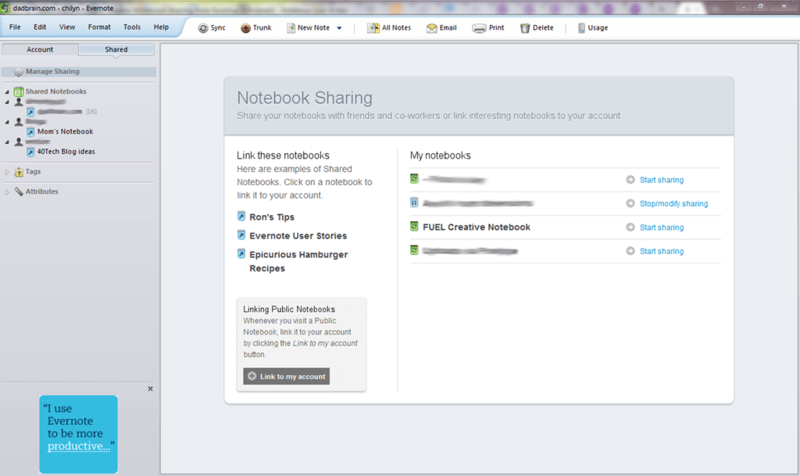 If a premium user shares a notebook with you, you have full access, even if you are not premium. I’m not a premium user and I am sharing one for viewing and have full access to two. If for some reason you can’t get started, try sharing a notebook from the web app and then going in and sync/restart the desktop app and see if that unlocks it for you.